Planes came into use in Japan much later than in Europe, sometime around the year 1500. Until that time, surfaces were smoothed with the so-called spear planes, called yari ganna. The spear planes, with their short, slightly curved blades at the end of a long handle, were drawn two-handed over the wood. They left behind a smooth, but slightly wavy or grooved surface. The models for wooden planes with a fixed iron probably came from China or Korea. With these tools, achieving a truly flat surface first became possible. Planes with a chipbreaker on the iron first appeared at the end of the 1900s. This feature perhaps was borrowed from Western tools at that time. With its basic, rectangular form, the traditional Japanese plane is representative of a lot of the aesthetic that informs traditional Japanese design. But despite its almost primitive simplicity, the high performance and efficiency of the tools is surprising. It consists of basically two parts, sometimes four: the low wooden plane body, or stock, the very thick, slightly wedge-shaped iron, and sometimes a chip breaker and a retaining pin. There is no front knob, and no metal striking button. They have no grip, or tote, and there is no fine adjustment using a threaded shaft. Their handling and most importantly learning to set the iron using light taps with a hammer requires some time and practice to learn well enough to get good results. The planes are mostly designed for, and work best on various kinds of softwoods. Because of their minimal height and low center of gravity, the planes ride well on wood and tend to wobble less than their Western relatives. You work much closer to the wood with the Japanese planes than with the Western styles. In Japan, plane bodies were traditionally made using the wood of the Kashi tree, a kind of evergreen white oak. Because of its high hardness, there is very little wear on the sole of plane. Kashi wood is very strong and resists splitting, and so there are seldom problems with cracks or splinters in the body. Finally, the relatively light color of the wood makes sense, as it is easy to check the position of the dark plane iron because of the contrast between the two. So use a blank in Kashi wood, or a well seasoned blank from a species with similar properties, such as red beech, hornbeam, or fine grained maple. The wood must be chosen with special care. It should be straight-grained and tension-free, and should have been allowed to season at least two years. 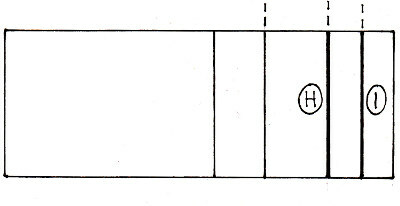 The "left" side, the side toward the center of the tree, is used for the sole of the plane, and the "right" side faces upward. It is possible that as the wood dries over the years, the sole of the plane can become slightly hollowed. The grain should run parallel to the sole of the plane or slant slightly down toward the iron. Such a grain orientation allows the plane to glide over the wood more smoothly, and wear on the sole is reduced. The two ends of the plane body, or dai, are named "atama" for the front, or toe, and "shiri" for the back, or heel. Note: these directions were documented in the Inomoto workshop in Sanjo, Japan, which specializes in the production of smoothing planes. Mr. Inomoto also provided the directions for the individual steps based on his own methods for building traditional plane bodies. Have a look at this video of our customer BergWerk how he made a DAI. 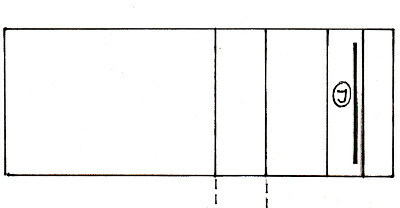 The board for the body, or stock must be first be cut to length and made true and square on all six sides. Mark the position of the mouth on the under side, or sole, of the board you are going to use for the stock. The position is based on a 60/40 division of the length of the board, with 60% in front of the iron and 40% behind it. Line A. Lay the body on its side and mark the angle of the plane’s iron. In Japanese smoothing planes, which will be used on softwoods, the irons are bedded at between 38 and 40 degrees. For hardwood, an angle of 42 degrees is recommended. Japanese plane makers mark the angle with a traditional graduated carpenter’s square, but you can also use a sliding bevel and protractor. Line B. Then lay your slightly wedge-shaped iron on the side of the body. The flat face of the iron is placed on the Line B. The iron should be placed so that it projects only about 80% of the way through the body. After cutting the mouth and the rabbet for the iron, this should allow the iron to bed solidly in the body. Now draw a line to mark the beveled back of the iron on the side of the plane body. Line C.
Transfer the lines from Line C across the sole of the plane. Line D.
Mark a line square across the side of the plane, starting from the foot of the line from Line C. Line E.
Transfer the line from line E across the top of the stock. 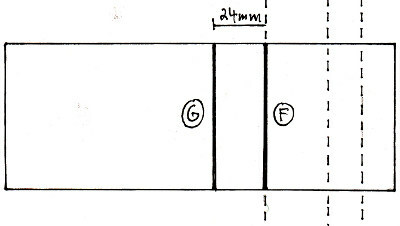 Line F. Then, 24 mm toward the heel of the plane from line F, mark a line square across the top. Line G.
Now transfer the "thick" upper end of the iron square across the top of the plane. Lines H and I. When drawing these two lines, you must be very careful. If the lines are not accurate, the rabbet in the cheeks of the stock to take the edges of the iron of the plane could be too wide, and the iron will be loose in the stock and the plane cannot be used. Then you must spend a lot of time and effort to fit infills to firm up the iron’s bedding. Now you need to take the iron, and measure, on the back side of the iron, how deep and wide the concave area is. This hollow spot is called the "shakumi" and because they are hand made, different with every iron smith and even every individual iron. Most however, end up about 0.5 mm deep. Transfer the profile of the back of the iron onto the top of the plane block, Line J. Mark on both sides of the stock the front part of the plane’s throat, where the shavings are cleared while planing. This will make it easier to drill and pare this part, Line K. This line ends exactly on the end of Line C where it ends at the sole. Do the same with the chipbreaker, and mark its width centered inside the L Lines. M Lines. You should leave about 0.5 mm of clearance between the sides of the chipbreaker and these lines so that it is possible to make small adjustments in the placement of the chipbreaker in the finished plane. On the top of the plane body, use a marking gauge and square to extend the M lines out to mark the sides of the plane’s throat, forming the N lines. Finally you use the iron and the chipbreaker to mark the same lines, L and M, at the same widths along the sole of the plane at the mouth. The first step is to cut out, to a maximum depth of about a milimeter a shallow rabbet in the sole exactly corresponding to the outline of the mouth. Be careful, the mouth will, under the cutting edge of the iron, be cut at a slant up toward the heel of the plane to form the throat and the bed. You can now cut the throat of the plane. The easiest way to do this at the level of accuracy needed is to use a drill press and its depth stop to rough out the shape and then use a chisel to remove the waste. When chiseling out the waste, you must use your eye and the C and K Lines that you marked on the sides of the body, to cut the bevels and the cheeks of the throat accurately. The rabbets for the wedge-shaped iron can now be cut in the cheeks of the throat with a narrow-bladed saw and then the waste carefully chiseled out. Mark the position of the retaining pin on the cheek of the stock. The pin is positioned 2/3 of the thickness of the stock up from the sole. When you mark the position for the pin, the iron should be in place and the chipbreaker held about 6 mm above the sole of the plane. In this way, with the iron properly set, you will then be able to set the chipbreaker firmly at the proper distance from the cutting edge of the plane. For fine adjustments when fitting the iron to its bed, you pass the the iron over an oil-soaked pad. It is then tapped into place with a hammer, and then knocked back out. The oil will have marked the spots where there is good contact with the plane body, and where you might need to remove a little material. The bed for the plane has to be cut slightly convex. This kind of fine adjustment, removing tiny shavings of material at a time, can need to be repeated dozens of times. So take the time to do it right and cut a perfectly-fitted bed to hold the iron properly. To reduce friction, the soles of traditional Japanese planes are planed slightly concave. On most smoothing planes, the sole contacts the wood at the toe of the plane and just in front of the mouth. In those areas, a strip of wood about 1 - 1.5 cm is left in place and the rest of the sole is planed or scraped away slightly, to about the thickness of a piece of paper. This is easiest to do with a traditional plane, called "dai-naoshi-ganna" (literally, a plane to tune plane stocks”). With these planes, the iron is set at almost a right angle to the sole, similar to our toothing or scraper planes. The width of the plane’s mouth depends on its use. If the plane will be used as a smoothing plane, the slot between the iron and the front of the mouth should be kept as narrow as possible. When making a plane, start out with a slot of about a half a millimeter. You can always make it wider if you find you need too. On planes like this one, with a chipbreaker fitted, the angle on the face of the throat away from the iron is about 80 degrees.